GEO ExPro - Takoradi: Ghana’s Oil City. Oil has been the catalyst for investment, reviving Takoradi’s fortunes as an export hub for Ghana’s many resources – but benefits to the local economy remain elusive. 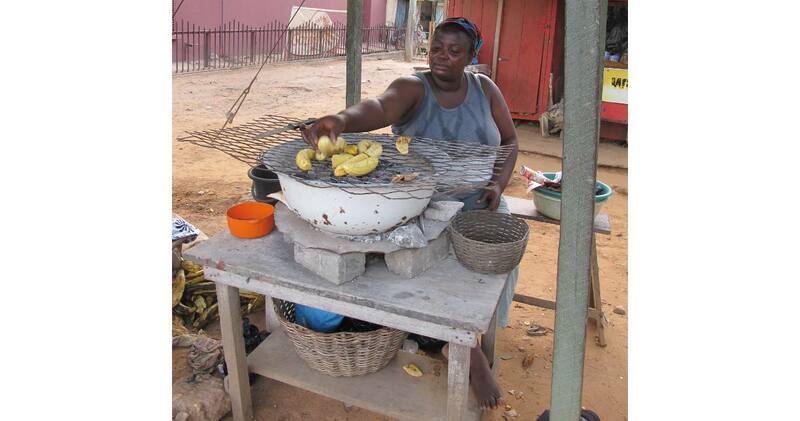 For the casual visitor, reports of Takoradi’s ‘booming economy’ appear greatly over-stated. Smaller than Accra, it remains low-rise and relatively free of the shiny four-by-fours that clog up the capital. The presence of oil production and service companies is relatively discreet. However, it is the prospect of significant off-shore oil production that has turned round the city’s fortunes over the last ten years, providing the catalyst for a major dredging and modernisation of the port facilities and a rapid expansion of the city. As new oil fields come on-stream over the next ten years, what chance that Takoradi will continue to develop and grow? 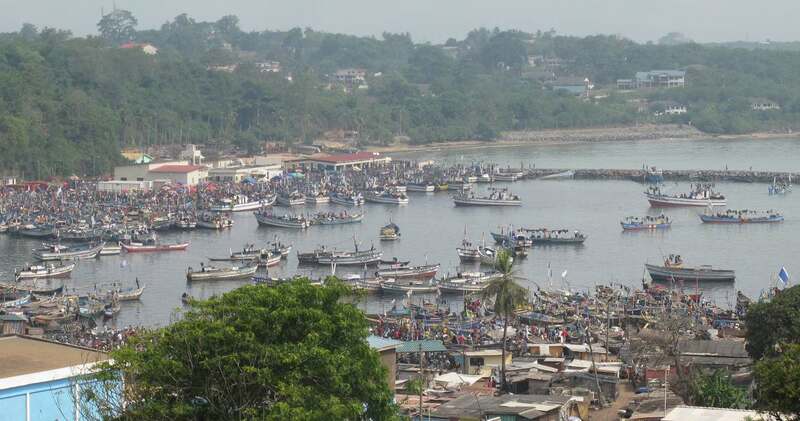 The area is more accurately known as Sekondi-Takoradi, a twin development of two neighbouring harbours that together have seen over 400 years of Europe-orientated commercial activity. Both benefitted from the building of deepwater port facilities in 1928, but by the 1960s the twin towns were running a poor second to the facilities at Tema, east of Accra. Oil has now firmly divided the two, reversing the decline of Takoradi but leaving Sekondi as the generally unvisited junior partner holding the consolation prizes of a low-tech fishing industry and a quiet naval facility. Meanwhile Takoradi has become a rejuvenated commercial hub. The expansion of the port began ten years ago and continues today with the building of new quay walls and extended breakwaters. An estimated 70% of Ghana’s exports are now handled by the port and the docks are dominated by activity surrounding the export of Ghana’s many resources, including timber, manganese, bauxite and cocoa – as well as the vast Maersk containers bringing in the imports on which Ghana, and land-locked countries to the north, have come to depend. Although oil has been the catalyst for the port’s redevelopment, Ghana’s oil does not, of course, come onshore – the Jubilee field produces 60 km off the coast using a FPSO. Development of the TEN (Tweneboa-Enyenra-Ntomme) fields is unlikely to alter this scenario since another FPSO is currently being adapted in Singapore, ready for production to begin in 2016. Although Takoradi may so far have escaped the anonymous high-rise office blocks, oil has brought a housing boom and rent inflation, a down-side of living in this rejuvenated town. Ex-pat housing can run to US$40,000 per annum and demand has led to the cutting down of large areas of forest and a building boom. ‘Land grabs’ from those who do not have written title deeds and rent ‘gazumping’, forcing out low-paid professionals, have been widely reported. 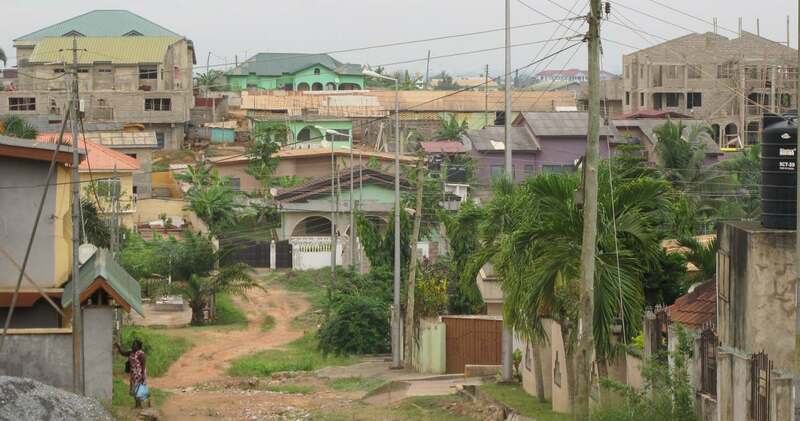 Surprisingly, perhaps, many new-build homes stand incomplete with few signs of activity: this is the result of the Ghanaian culture of building in stages since mortgages are generally unavailable, and also the result of Ghana’s recession that is closely linked to the early 2014 currency crisis and lower-than-expected oil production. 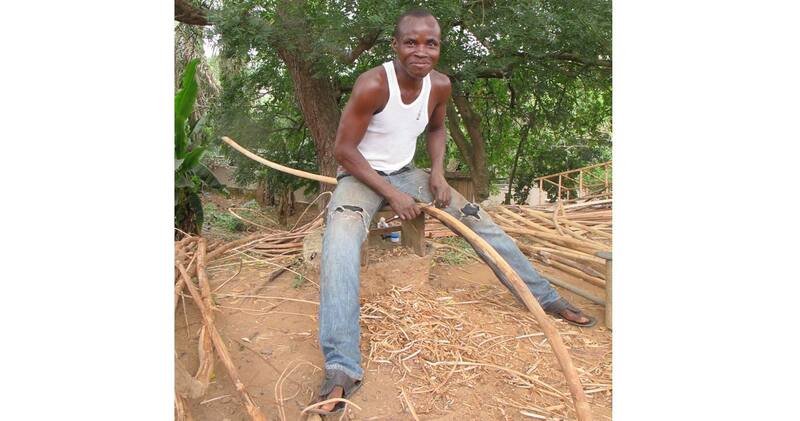 The net effect is a large area of isolated houses at various stages of completion, separated by unmade roads and scrub. Municipal infrastructure has not kept pace with development, evidenced by the prevalence of polytanks for water storage and private generators to avoid electricity ‘load-shedding’. For the majority, little of the new wealth is trickling down into the local economy. Incomes remain a typical US$1–2 a day and street life is dominated by the dawn-to-dusk hawking of food products, lottery cards and phone top-ups. An interesting development, however, is the proliferation of foreign and Ghanaian banks, many of which appear to be targeting the poorest with micro-finance and microinsurance schemes. Many of the least wealthy traders and taxi drivers are now able to save with a bank and some have ATM cards: they are considered such a valuable source of funds that many banks send out staff at the end of each day to collect the workers’ profits, often a mere ten cedi (£2.50). Fortunately for the Ghanaian economy, anecdotal evidence is that the poorest workers remain wary of taking on loans and simply save: the high-risk household debt seen in other emerging economies does not yet appear to be a problem for Ghana. Despite shortages of the most basic services – water, toilets, electricity, surfaced roads – the people of Taadi (as the city is known locally) remain remarkably tolerant and warm-hearted. Crime, as in all Ghana, is relatively rare – although the demand for ‘dash’ at police road blocks is a notable and recurrent complaint. Moslems and Christians are well integrated and life is characterised by an absence of aggression – even in the somewhat chaotic driving. Inevitably there is a frustration with government and a perception that oil revenues are being mismanaged: the good news for Ghana is that its history of military interventions seems long gone, democracy and civil society are well established and regional divisions are minimal.Civil unrest may be a remote possibility but clearly Ghana’s oil boom is fragile. Unemployment and under-employment are the facts of life here. Happily, it appears that the government is set to deliver one very real benefit from oil production: summer 2014 should see the completion of a Chinese-built pipeline, gas processing plant and an extra 132MW of capacity at the electricity plant 17km east of Takoradi. They will take associated gas from the fields, help stabilise electricity production and eliminate the current need to burn $1bn worth of oil annually for power. In general, politicians and oil executives are keen to stress that ‘expectations’ need to be ‘managed’: however Ghanaians are acutely aware of their poverty and lack of basic infrastructure and all eyes are on the government and conversely, their management of revenues. For the people of Takoradi there will be particularly keen scrutiny since so much of their ‘boom’ has been built on investments to facilitate commodity exports. The local economy appears particularly vulnerable to a global downturn in demand – and for the majority there is no ‘cushion’, only the rather uncertain prospect of increased oil-related employment and export-related investment. Calgary, in Alberta, Canada, portrays the cattle and oil industry image of Dallas with the cosmopolitan feel of London. A beautiful location overlooked by the Rocky Mountains; history, culture, four seasons and the “greatest snow on earth” – Salt Lake City in Utah has plenty to offer the visitor.